Eden Ahbez was the assumed name of Alexander Aberle, born to a Jewish family in Brooklyn. Little is known of his trek across the United States to California where he lived in public parks as a pre-‘60s, vegetarian hippie with long hair, long beard, and sandals. Even after he married Anna Jacobsen and had a child, he and his wife camped out in their sleeping bags on public property, and he often spent his days on street corners touting mystical faiths. He went by the nickname “ahbe,” spelled without a capital letter as he felt those were reserved for divinity. In 1948 he collared Nat “King” Cole’s agent and gave him the handwritten music for “Nature Boy.” Although Cole recognized the similarity to a Yiddish tune, he recorded the song the following year and it became an immediate hit. The publishers of “Schwieg Mein Hertz” sued and settled out of court. Cole later recorded Ahbez’s “Land of Love” but without success. Then Ahbez seemed to just disappear, although there are suggestions that he did some recording with studio groups in the ‘50s. Del-Fi record executive Bob Keane searched for Ahbez in 1960 in order to bring him into the studio to record. 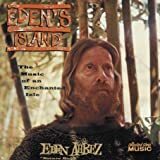 For the album Eden’s Island Ahbez recited his poetry against a backdrop of jungle music, creating a bizarre bit of exotica. He was photographed in 1966 in the studio with Brian Wilson which has led some to speculate on Ahbez’s “exotica” influence on the Beach Boy. Ahbez was struck by a car and died in 1995. Burke & Van Heusen Inc.